LIR II - Lecteur InfraRouge est un détecteur HAUT DE GAMME munis d'un écran LCD. LIR II - Lecteur InfraRouge permet également de vérifier plusieurs billets simultanément. The LIR II Infrared Video Detector (we will call it as Device in the later contents) provides a very sure way of detecting counterfeit notes. By visualizing the IR marks you can easily find the super quality counterfeit banknotes by your eyes. With designated dual frequency infrared exchange function, you can find the blinking mark on the genuine banknotes. 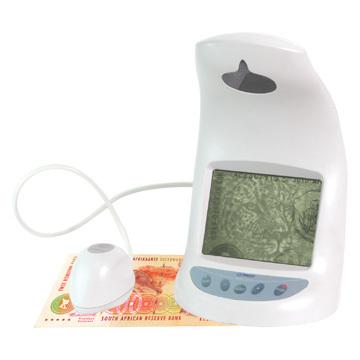 With connecting additional device MC2202 Mouse Camera, you can check the Micro-printing on the banknotes shown in infrared, ultraviolet light and daylight under magnification of up to 10 times, easily investigate in details the location, shape and structure of IR mark, microprint characters and UV mark.